Wow, the level of crazy within the leading field of Republican presidential candidates has remained incredibly consistent throughout the string of irreverent debates. However, cutting through the side issues, the primary GOP PR strategy for the election centers on economic issues: government debt and job creation. The only major back and forth occurred around a curiously meaningless debate: which governor on stage presided over the most job growth and who would create the most jobs as president. For a party that claims government does nothing as well as the private sector and that efforts to improve society are a fools errand, it’s an odd obsession. If you believe, as Mitt Romney has repeatedly asserted, that it is business rather than government that creates jobs then how can you argue that you will do so as president? The governors all came prepared with job-related factoids to hurl at each other. “Michael Dukakis created jobs three times faster than you did, Mitt,” said Perry, while Huntsman told Perry that forty-seventh best “just won’t cut it.” Romney countered that Texas created more jobs under Perry’s predecessor, George W. Bush, than under Perry. He also defended his record and minimized Perry’s by noting that Massachusetts and Texas have different political and economic conditions. You know that Social Security and Medicare are in jeopardy when even Democrats refer to them as entitlements. "Entitlement" has a negative sound in colloquial English: somebody who is "entitled" selfishly claims something he doesn't really deserve. Why not call them "earned benefits," which is what they are because we all contribute payroll taxes to fund them? That would never occur to the Democrats. Republicans don't make that mistake; they are relentlessly on message: it is never the "estate tax," it is the "death tax." Heaven forbid that the Walton family should give up one penny of its $86-billion fortune. All of that lucre is necessary to ensure that unions be kept out of Wal-Mart, that women employees not be promoted and that politicians be kept on a short leash. It was not always thus. It would have been hard to find an uneducated farmer during the depression of the 1890s who did not have a very accurate idea about exactly which economic interests were shafting him. An unemployed worker in a breadline in 1932 would have felt little gratitude to the Rockefellers or the Mellons. But that is not the case in the present economic crisis. After a riot of unbridled greed such as the world has not seen since the conquistadors' looting expeditions and after an unprecedented broad and rapid transfer of wealth upward by Wall Street and its corporate satellites, where is the popular anger directed, at least as depicted in the media? At "Washington spending" - which has increased primarily to provide unemployment compensation, food stamps and Medicaid to those economically damaged by the previous decade's corporate saturnalia. Or the popular rage is harmlessly diverted against pseudo-issues: death panels, birtherism, gay marriage, abortion, and so on, none of which stands to dent the corporate bottom line in the slightest. 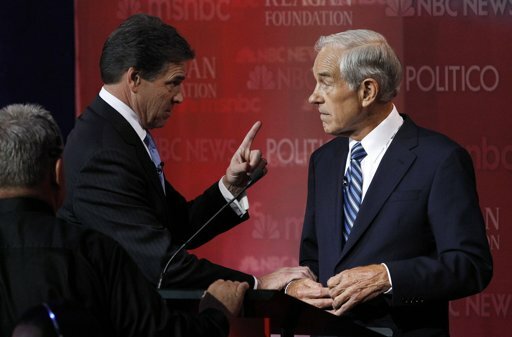 Governor Rick Perry (TX) and Representative Ron Paul (TX) during commercial break. Needless to say, the focus on stoking populist rage while bolstering polices that help businesses more than American citizens is no way to create jobs. It is almost laughable that such circular logic packaged in punchy soundbites can convince anyone that these candidates and their ideas should be taken seriously. However, I personally, cannot laugh at these people until everyone else is laughing too. Because we all should be. The real world implications of the GOP PR strategy translating into actual policies are already coming to fruition in dozens of states via union busting, de-funding or underfunding government services, and tightening voter registration requirements. Did you hear Huntsman? Rog and I thinks he's the only vialble candidate the repbubs have. Huntsman said "if we rebublicans are going to win, we must quit avoiding science and quit making assertions that turn people off (he was speaking of the religious crap) strangly he's way down the list for the repbubs. Not strange actually considering. Good new is that the tea party in now the most hated group in America, even more that the atheists and Muslims. Yeah,Huntsman is definitely the moderate out of the bunch. However, its like I say in my latest post on the GOP debates... that's not what really matters in these debates to that voter base. its all about the look of it and who has the best soundbites. And huntsman isn't winning that contest compared to Romney or even the disastrous Perry. Remember, the GOP voter base was impressed by f-ing Donald Trump. I think they really are going to try to ride the crazy horse straight through to the primaries. Especially gearing up for the Iowa caucuses.